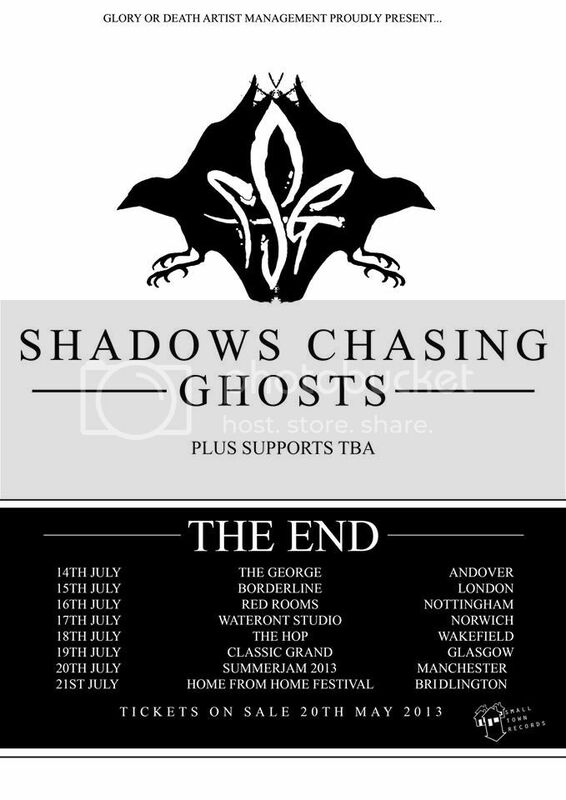 HomeNewsNEWS: Shadows Chasing Ghosts reveal they are to part ways and announce final tour! NEWS: Shadows Chasing Ghosts reveal they are to part ways and announce final tour! There’s no easy way to say this, but it’s time we told you all. Shadows Chasing Ghosts will be no more after our SummerJam appearance this coming July. We’ve been wrestling with our personal lives, finances, 3 fucked vans in the space of 2 years and countless other small niggles for some time now and we’ve come to a point where being in a band isn’t what it was supposed to be for us. The love has gone, except for the 45 minutes we’re on stage every night when we can forget all the things that are going on around us. So without delving too deep, we’ve made the decision to call it quits and move on with our lives. We feel the time is right and we hope you understand and that you’ll come out to see us play one last time in the near future. We’d like to say a huge thank you to EVERY single one of you who has ever been to a show, or bought merch, or spoken to us online/plugged us to a friend/helped us out in any way – you mean more than you know to us and we hope you’ll continue to support us in any future endeavours we undertake. Also a huge thanks (in no particular order) to Rich Jones, Damian Cummins, Jack Mackrill, Chris Broadhurst, Pete & Alex at Small Town Records, Gavin King, Andy Hurst, Holly Raven, Marianne Harris, Ian Collins, Neil Starr, Michael Douglas, Beckie Sugden, Kyle Wheeler, Dan Misztal, Mark Kozuch, Scott Howarth, John Mitchell, Ben Humphreys, James Billinge, Kevin Bebout, Ray Marquis, Riisu Iffland, every band we’ve ever had the pleasure to play with and everybody else who’s been part of the team at any stage, we love you all. We’re at Takedown this weekend in Southampton, which will be awesome for many other reasons than us; and we’ll be announcing some more shows very soon with some good friends of ours so we can say goodbye properly to you all. So, love us or hate us – let’s put this thing to bed the right way. Come out and celebrate the end of what was once the most important thing in our lives. NEWS: Shadows Chasing Ghosts reveal details for second full-length album, ‘Lessons’! NEWS: First bands confirmed for Hit The Deck Festival 2012!